You might be a redneck if you think a family reunion is a good place to pick up girls. You might be Jewish if your greatest athletic achievement was in debate. If you own a $3,000 machine gun and a $5,000 rocket launcher, but can’t afford shoes, you just might be a terrorist. If you’ve never realized that the Alphabet song and Twinkle Twinkle Little Star have the same melody, you’re probably a blond. Of course, the above were lifted from “You might be…” lists on the Internet. It’s all in jest. I would never intentionally offend rednecks with guns, any Jewish person who might someday be my cardiologist, or a fundamentalist Muslim with a bomb in their skivvies. Blonds, well… they don’t know when they’re being offended. But how do you know if you may be addicted to the wonderful sport of darts? Thanks to the infamous Phil “the Mad Hatter” Fried and a new Facebook discussion group called Darts Addicts Anonymous there is now a way. Below, from among many, are signs that you may have a problem. You have a darts-related tattoo. At work you sometimes hold your pen or pencil like a dart and pantomime a throw. You cancel a date with a tall, gorgeous, strawberry blonde to substitute for league, and she kicks you to the curb. At Halloween you dress up with a Styrofoam dartboard around your head and a scoreboard around your body. You are considering a move to another city because they have more darts bars. When fishing all you can talk about is the next darts shoot. You can pronounce and spell Kuczynski, Silberzahn and Panuncialman. You have quit a job because it interfered with one of your league nights. 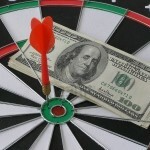 With your back to the board you can tell if a bulls-eye is scored just by hearing the distinctive “thunk” a dart makes when it hits the center of the board. When someone shoots the wrong out everyone says they pulled a (insert name) – and that’s your name. When you go to dinner with family or friends the easiest way of splitting the bill up is to calculate how many of what triple equals the total. When the time is 3:03 you think 19s. You practice your throw by tossing paper wads into the wastebasket at work. You name your dog Oche. Instead of numbering the tables at your wedding you use names like oche, bulls-eye, double trouble, and bed and breakfast. The first thing you do in the morning is throw three darts and let the result predict what kind of day you are going to have. Your first regret after punching something is that you used your dart hand. You have a broken wrist and sprained thumb but still play league or a tournament. You decline to move in with your girlfriend because there’s no place to hang a dartboard. You base your clothes shopping on whether the sleeves are too tight and might impair your throw. You crush your thumb and break bones in your hand on the weekend but still play league on Monday. You can watch a Phil Taylor match and accurately determine when the match occurred based on his weight. Most of your wardrobe is darts shirts. You get excited when you find a good quality YouTube video of a match you missed but become disappointed when the commentary is in Dutch – but then watch it anyway. Each time you look at your phone and see the time or battery power remaining you figure the out shot in your head. You take your own darts to a carnival for the balloon pop game. You have searched for a set of darts on the Internet, stumbled across articles about poison dart frogs and the Dodge Dart, and are now a semi-expert on both. The first thing you do after cutting your hand is pick up a dart to see if hurts to throw. Your dog loves the sport as much as you. You catch yourself calling out outs when you see highway exit signs. You try to use your DARTSLIVE card to open your hotel room – and you’re at a steel-tip tournament. Your Facebook profile photo is one of you throwing a dart. You would never dream of purchasing a shirt without a pocket. Your day includes no dart plans but you grab your darts case anyway, just in case. When Meatloaf is singing, you are sad because, damn-it, two-out-of-three is bad. 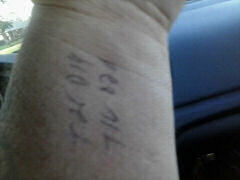 You write outs on your arm to memorize them. You wonder whether or not you can get your nails painted to look like segments on a board. You stay and chalk after you have been knocked out of a blind draw hoping another draw will be started. Even though you are not from Dallas you know what D.A.R.T. means. When someone asks for quarters you just give them a dollar bill. You set your alarm to get up at 7:00 a.m.to practice and realize much later, when your hands start shaking, that it’s 1:30 p.m. and you haven’t eaten – and your blood sugar is down to 67. You have an iPod mix labeled “Dart Mix” to help get you in the right mood before a match. You plan your wedding around upcoming tournaments. 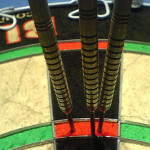 Most of your “friends” on Facebook are darts players and you’ve never met them. 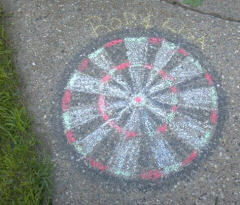 One of your “proud parent” moments is your child’s first bulls-eye. While in the hospital with a newborn baby your husband is making the baby’s first set of darts out of Q-tips. 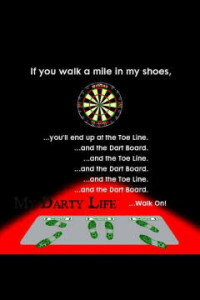 You cringe when you hear a non-darter explain strategy to another non-darter. You only smoke when you throw darts, but you still smoke two packs a day. You got married at a tournament – on May 1. When you go to the doctor for your physical and need a shot and the nurse asks “Which arm?” you automatically roll up the sleeve on your non-throwing arm. You go to the convenience store and buy three things at $20 each, three things at $19 each and two things at $25 each and do not have to take time to calculate how much you owe. You play make believe games against the best in the world and win every single time. You can show up early to a shoot but can’t make it to work on time. When you visit a new town the first thing you ask for is the nearest bar with a dartboard. You know there is a dartboard in “The Big Bang Theory” and also know that it is about 11 3/4’s inches too low. When you walk into a dart bar you have never been to before everyone knows your name. You burn yourself grabbing a pan from the oven and tell everyone all is fine because it is not your darts hand. You have seriously considered purchasing Jacqueline Carey’s novel “Kushiel’s Dart,” even though you know it has absolutely nothing to do with darts. Your phone auto corrects or predetermines all your words for darts or bar names you frequent. You are not disappointed when a lady tells you she likes soft-tip. You realize there is no cure for this crazy disease – and you are happy about it! Thanks to everybody who contributes and continues to contribute to the Darts Addicts Anonymous discussion group. And my apology to all blonds. March 5, 2014 Column #HR109 Sandra Bullock’s Behind Worth $70 Million. 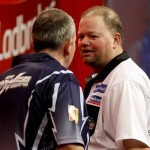 Does Phil Taylor Care? February 1, 2000 Column #84 So You Want to be a Darts Millionaire?